Increasing and improving access to existing and new and emerging transportation options for disadvantaged communities is a goal shared by a growing number of well-meaning stakeholders in the Portland-region. While it has been easy to agree on the need, there has never been a true “needs assessment” seeking feedback from Portland community members facing challenges to how they get around. 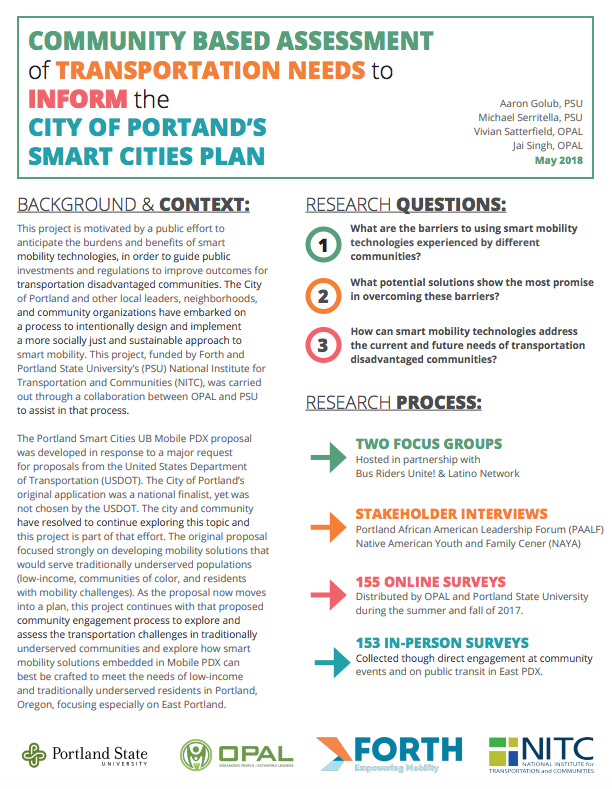 Forth is excited to announce that in the fall of 2017 we partnered with OPAL Environmental Justice Oregon and Portland State University to facilitate a Community-based assessment of Smart Transportation needs in the City of Portland. The report is finally available and a selection of the findings is below. There is a need for education. There is a widening gap between English and non-native English speakers in regard to app-use, training, and access to mobility options. Having access to in-person trainings at trusted institutions such as neighborhood schools may help bridge the knowledge gap as technology use increasingly becomes the norm. Meanwhile we need to ensure that signage is at least in both Spanish and English. We need to be aware of the barriers to documentation and financial services. Roughly a third of the participants participating in this study did not have a checking or savings account and as transit and transportation becomes more digitized it is important to remember that a large population of users who depend on transit would like to continue to use cash. Many community members are also unable to obtain drivers licenses due to Oregon’s license law requiring proof of citizenship. Access to internet and phone charging is a problem. Nearly 40% of the lower income study participants shared that they were likely cancel their cellphone plan due to data plan limits and cost. Improving access to public wi-fi in addition to places where folks can charge their phone can support the use of apps, and other connected use technologies. There are significant equity issues determined by housing type. Lower income and respondents of color in this study were significant more likely to live in a multiunit apartment building and consequently expressed greater challenges in accessing electric vehicle charging facilities. As more electric charging is planned for our region and as more used electric vehicle become available, pro-actively thinking about how we can support charging for those living in apartments will be essential. According to this research low income respondents and respondents of color are “not only more multimodal, but more regular users of currently available mobility tools”. As policy and long-term plans are developed let’s ensure we that consider the feedback of the populations we seek to affect and not widen the inequality in the distribution of smart mobility options.